Are you a fan of football? Love those football clubs like Manchester United or Arsenal, and any of their rivalry. Do you like to play slots for fun too? Well then, we have got you covered because we have got a game that combines all of the above. 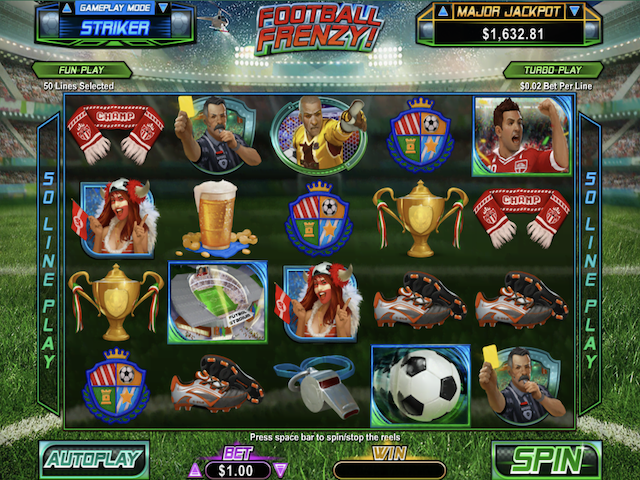 The name of this game is Football Frenzy slot, and as you may have guessed it, it is an online football themed slot online game. It is a very different one when compared to the slot games available at our casino. The features that this game possesses are tremendous and you should take a overview of them. The first feature of the Football Frenzy slot online is that you can win through 50 different pay lines. Chances are you may will a lot of payload when playing this game because the game offers its players, 50 pay lines with different patterns. Usually most of the slot games have only 25 of these differentiated pay lines. One is called the striker mode and the other one is called the lucky mode. In lucky, you will have the lucky feature enabled. The lucky feature consists of free kick free games that maybe triggered at the end of any normal game. Up to 8 free games can be awarded as part of the lucky feature. In striker mode, the wins and payloads from the free games are always tripled. This is a symbol based on the striking player in a football match. If this symbol comes along in a winning combination, it can be used as a substitute for other symbols excluding scatters. Striker wild doubles the prize and It can also appear in free games always on reel 3. You can play an actual-in game penalty that maybe won during the free games. Please note that it is only available in striker mode. The penalty kick bonus can make your multiplier reach up to the number of 900x based on the number of goals. The Football Frenzy slot online also has bonus balls symbols and gold bonus balls. These bonus balls are the ones that give you penalty kicks if they appear in all the reels and during free games. Gold bonus balls are awarded after 2 misses or (maximum) 8 goals. You can triple the prize through it and kicking it again will earn you another triple. There are also a number of different kinds of scatter wins in the Football Frenzy slot. If you get 3 stadiums, you win 8 free games, if 4 stadiums then 10 to 25 free games and if 5 stadiums, then you win more than 50 to 100 games.